While using Windows 10, you can enable these settings for windows 10 fast startup or make windows 10 boot up faster. The best thing is that you can disable these settings at any time. One of the best things about Windows 10 is its user-friendly interface as compared with windows previous versions. Also, it has come up with many features for a better experience and fast roaming. If you use windows 10, then you can enable the following settings for windows 10 fast startup. This will make windows 10 boot up faster. Whatever specification your PC has, this windows can make you a better experience. The thing that is under consideration is the fast booting of Windows 10, especially when you restart the windows and it takes more time as compared to the normal booting time taken by the windows to load. The following settings will help for fast booting of windows 10. Click “Choose what the power buttons do” on the left side of the windows. Under “Shutdown settings” make sure “Turn on fast startup” is enabled. If no, then enable it. When installing for the first time, the settings are by default. However, if you are upgraded from previous versions of windows, like from windows 8.1 to windows 10, then it might not be enabled, so you have to enable it manually by the above-described steps. When we enabled windows 10 fast startup settings, then it will create an image of loaded Kernel File including all settings as a file called “hiberfile”. So in this way when the system boots up again, it will load with greater speed, making windows boot time much faster. 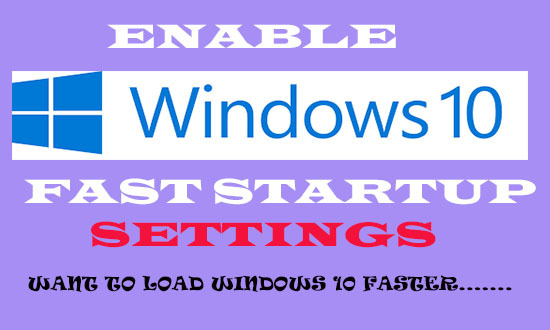 Hope so you will get enough knowledge for windows 10 fast startup settings, do comments with your feedback.